Showing 12 articles from September 27, 2014. Rite Aid will be giving flu shots on Tuesday, October 14 from 11 am-1 pm at the Pacific County Senior Center located at 324 Jackson St. in Raymond. The flu shots are available to all ages. The small island of Puerto Rico holds many treasures, some of its most awe-inspiring being the numerous majestic cave systems carved by the ocean, rivers, and heavy rains over thousands of years. Lisa Ayers has proven herself one of the hardest working county employees we have and she has a great deal to show for the work. We can all appreciate what she has done for Pacific County. I'm troubled by Mr. Burke's political advertisement which claims he doesn't let budget concerns affect prosecution. That is simply inaccurate and perhaps the most glaring example of this was his dismissal of 26 of the 27 felony counts, which involved a government official's misconduct and embezzlement. This is the second time I have voiced my concern on this new organization [new at least to Pacific County] known as TAC [Teen Advocate Coalition]. Because of the privacy laws in this state for minors a parent cannot be informed on their child's situation from even your longtime family doctor such as your child is pregnant or has venereal disease and much more! Working smoke alarms can make a life-saving difference in a fire. That's the message behind this year's Fire Prevention Week campaign, "Working Smoke Alarms Save Lives: Test Yours Every Month!" 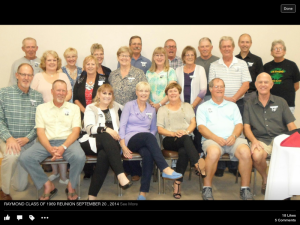 The Raymond HS Class of 1969 celebrated its class reunion at Little Creek Casino near Shelton. Those attending included, Row 1: Gene Peeples, Randy Ostman, Noni Blakely Lloyd, Vicki Campbell Halpin, Lesli Dilk Konigsberger, Vern Haerling, and Al Mouncer; Row 2: Laura Langer Heatley, Ronda Dickson McNeely, Shelly Wilson Richey, Kathy Strozyk, Jan Vanderslice Door, Mike McKinney, and Terry Stark; Row 3: Jeff Strumski, Leona Somero DeLaurier, Vivian Gailey Reinen, Chris Halpin, Vince Konigsberger, Joe Nelson, and Mark Coburn. Not pictured is Carla Rinehart Sontag. 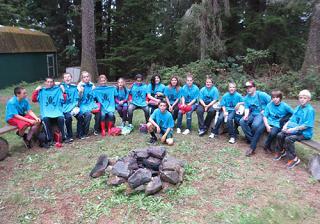 On Friday, September 19, the Willapa Valley sixth grade class visited Bruceport Park and participated in the annual Adventure Day. The Adventure Day, organized by the Pacific County Health Department, consists of a variety obstacles or challenge courses that require students to use teamwork and listening skills to conquer the challenges. All who participated had a great time. A special thanks goes out to Melissa Sexton and Lenora Tanaka for putting on this year's Adventure Day. Judge M. J. Shahour received word this week that Stanton Warburton, Progressive candidate for Congress, and Ole Hanson, Progressive candidate for United States Senator, would be in Raymond next Monday afternoon to address a meeting to be held in one of the halls and in the evening they will speak in South Bend.